All of the photos below may be enlarged by clicking on them. Since there are so many photos, this post might take awhile to load on your screen. If you happen to know these guys, would you please tell them I posted this photo? I told them that I'd email, but I misplaced the email address. 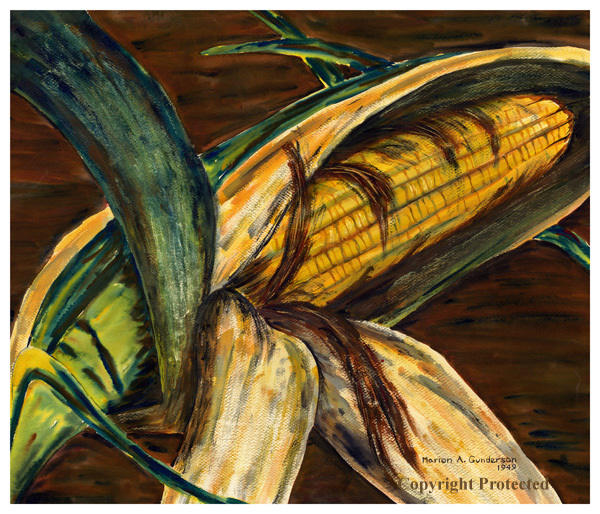 On the first Saturday in March for the past three years, Katie, Joe, Bill and I have delighted in attending Living History Farms’ (Urbandale, Iowa) annual Beer ‘n’ Bread fund-raising event. 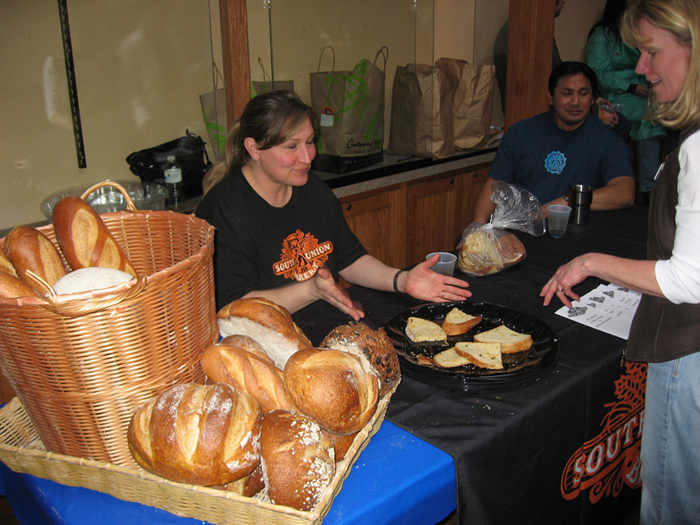 Each year we sampled home brewed and microbrewed beers as well as locally baked fresh artisan breads. Represented this year at the three-year-old event were two bread vendors, six microbreweries, one macrobrewery, and the Iowa Brewers Union. Upon entering the event this year, each participant received a “free” mug (included in the ticket price of $15 per person or $25 per couple). As you might have guessed, the mug was used for the sampling of as many different beers as many times as a guest wished. 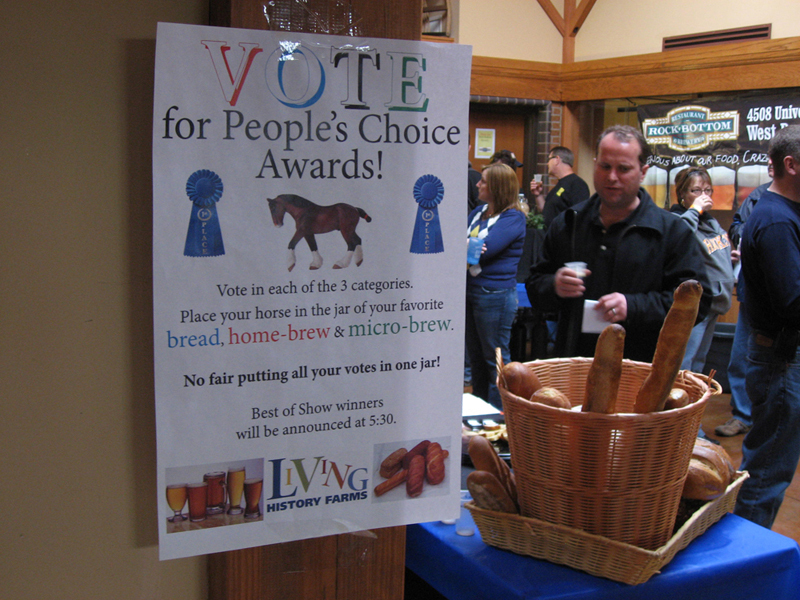 Tokens for voting for favorite 1. bread 2. home brew and 3. microbrew. 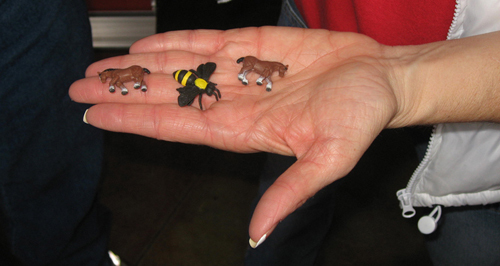 With the mug were three tokens (either tiny toy horses or bees). 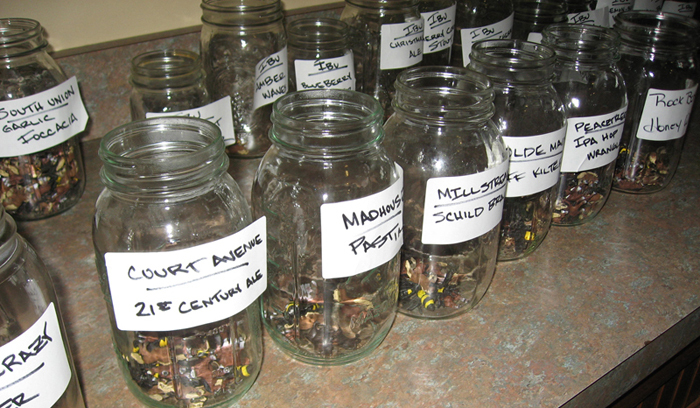 These tokens were used for voting: one vote for the favorite bread, one vote for the favorite microbrew, and one vote for the favorite of the twelve brews of the Iowa Brewers Union. Official voting rules posting around the corner from the South Union Bakery table. It was tough to know which bread to vote for because there were two categories of bread vendors. 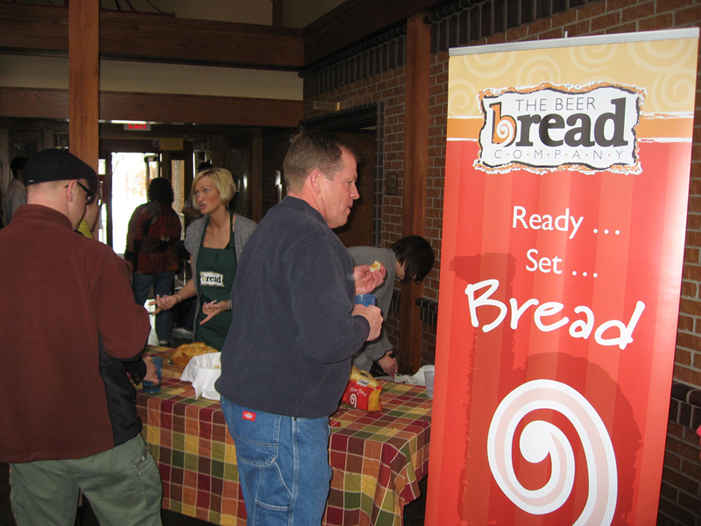 One was a bakery, while the other offered packaged beer bread, dip, spread and cheese ball mixes. I went back for seconds and thirds of the Beer Bread Company’s (Sac City, Iowa) beer bread and later bought two packages of the beer bread mix in the Living History Farms’ gift shop. Although I voted for the beer bread, I’d purchase the South Union Bakery’s (Des Moines) already-baked Garlic Foccacia in a heartbeat. Millstream's (Amana, Iowa) Windmill Wheat got my vote. 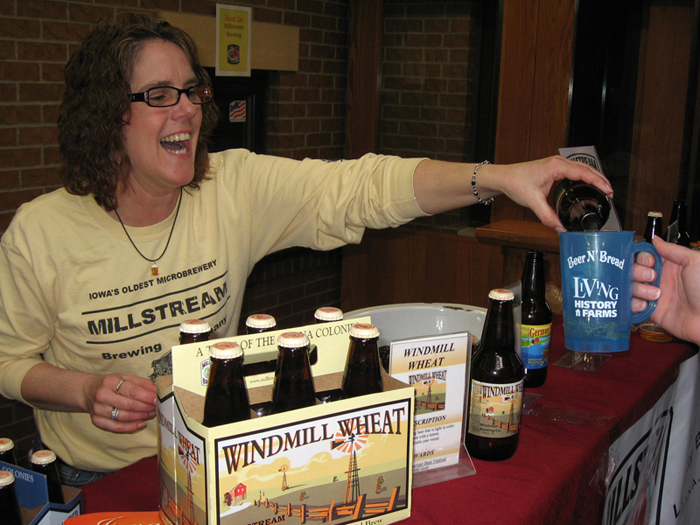 As far as the microbrews and home brews at this year’s Beer ‘n’ Bread event, my favorite overall was Millstream Brewing Company’s (Amana, Iowa) Windmill Wheat. 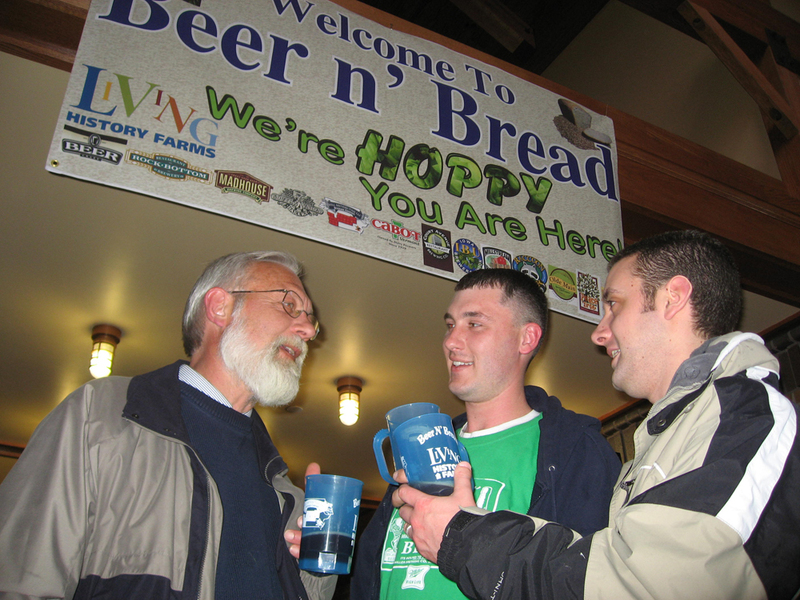 Bill’s favorite microbrew was the Colony Oatmeal Stout from Millstream. 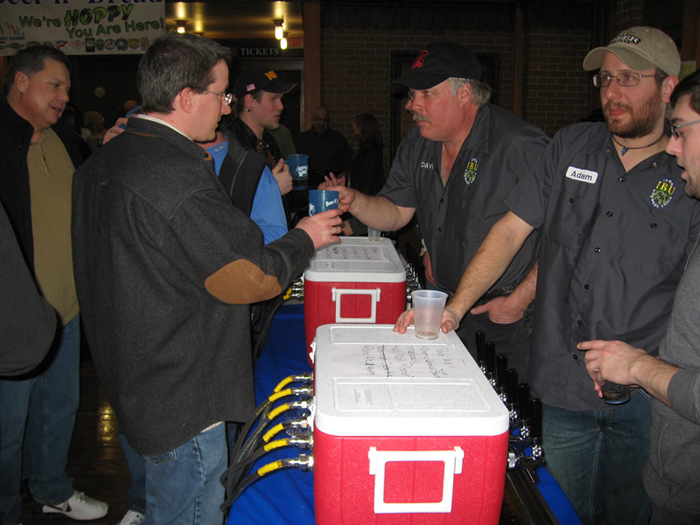 His favorite of the twelve home brew varieties from the Iowa Brewers Union was the Pale Ale #2 Hoppy. The Iowa Brewers Union offers good beer and good advice. It meets the third Monday of every month at the Holiday Inn on Merle Hay in Des Moines. Meetings are open to the public. More information is available at http://www.iowabrewersunion.org. 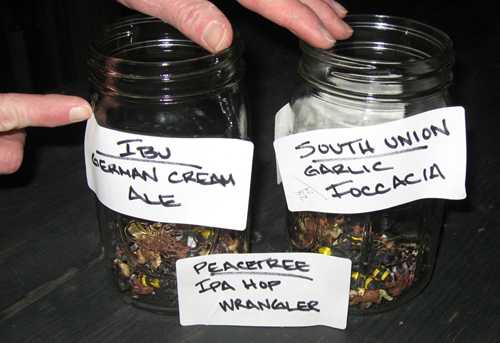 A partial representation of voting jars for the breads and beers at the Beer 'n' Bread event. 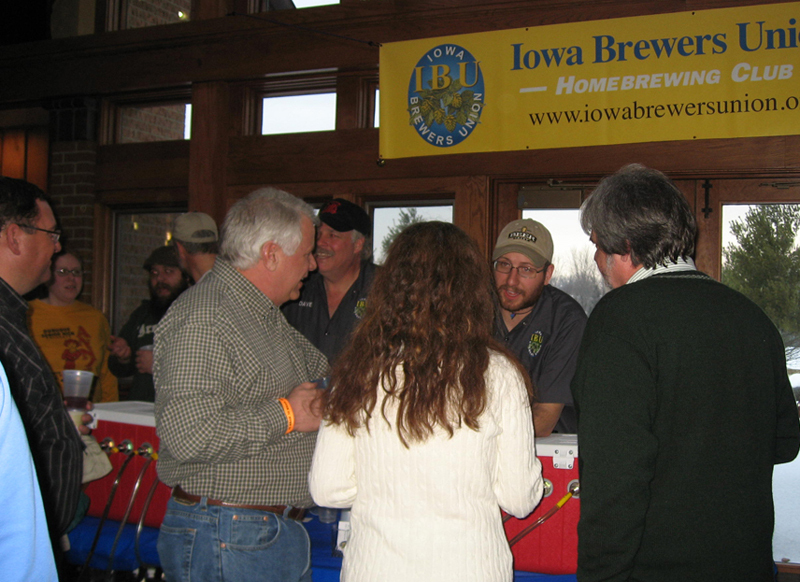 The Iowa Brewers Union offered 12 home brew varieties for sampling. What we like about the event is that…well…obviously we get to sample a wide range of varieties of beer as well as mouthwatering bread. An added bonus is that while the event is never too crowded, we brush shoulders with guests and vendors who share our interests and are glad to offer advice. 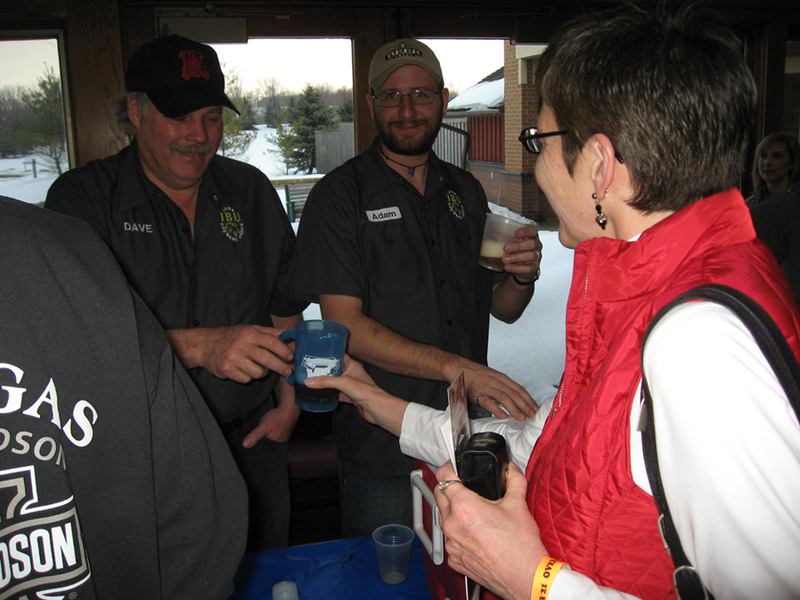 For example, the beer meisters from the Iowa Brewers Union (IBU) exude such enthusiasm about their beer making. I’ve tried to rewrite this next sentence about ten times and I keep coming up with…The IBU Beer ‘n’ Bread participants are like grown up little kids. They love to tinker with their beers, and they relish sharing what they’ve learned in the process. The Beer Bread Company (Sac City, Iowa). South Union Bakery (Des Moines, Iowa). The Iowa Brewers Union again. They're just so friendly! And the 2010 Beer 'n' Bread winners are.....! This entry was posted on March 20, 2010 at 10:26 am and is filed under Beer Making. You can follow any responses to this entry through the RSS 2.0 feed. You can skip to the end and leave a response. Pinging is currently not allowed.